This year DecisionCAMP was held in Luxembourg Sep 17-19 as a part of the Logic for AI Summit. It became an important event that attracted experts and practitioners in the business decision management from 14 countries. We had 54 official registrations and sometimes even more people were present in the auditorium. The representatives from almost all major BR&DM vendors and many well-known experts attended the event. In these notes I will try to share my view of what was happening during the CAMP. I tried to tweet about all sessions as they were happening – see my tweets between Sep. 17 and Sep. 19. Unfortunately, we did not have live blogging usually provided by James Taylor who was not able to attend this time for personal reasons. As always at Decision CAMPs, the audience did not allow any presenter to talk about what most people already know: the presenters needed to respond to serious questions about the substance and innovations during and after their presentations. It was not simple for me to stick to the schedule while allowing hot discussions to take place in real-time. But I am glad that afterwards many attendees told me that the event was well organized and executed, kept everybody involved, and forced people to rethink already established concepts and approaches. We had enough time for the conference networking, informal exchange of opinions, and it seems DecisionCAMP provided a great learning experience for most of the attendees. I will not be able to discuss every presentation in detail – you can find all of them here. I will briefly go through them day-by-day and concentrate on the points that raised the most questions and/or caused hot discussions. 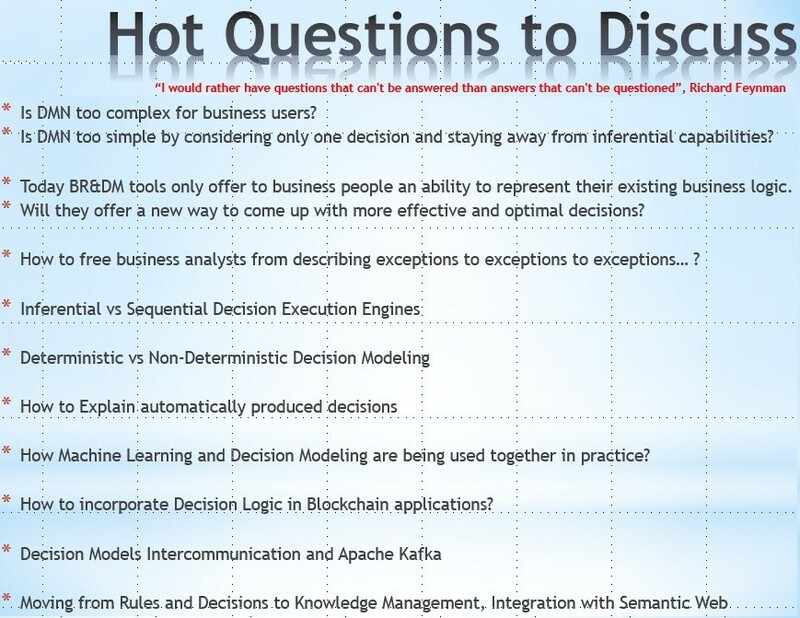 Many of these questions plus other practical DM issues were addressed during the DecisionCAMP’s presentations, QnA panel, and in private discussions. We started with 3 presentations from the members of the OMG DMN Group. Alan Fish talked about collaboration between BPMN, CMMN, and DMN standards while building decision-making systems. Alan described several real-world use cases using FICO Decision Modeler. There was a question of why FICO DMN modeler still supports only S-FEEL and not the complete FEEL. Fernando Donati, a FICO product director, responded that it is dictated by the real-world demand, but their customers will see even more powerful and better integrated FICO tools in the nearest future. Denis Gagne talking about decision automation using Models, Services and Dashboards, put special emphasis on the importance of stateless decision services in DMN 1.2: “The more I use DMN the more I am convinced organizations should focus on modeling reusable decision services”. He also stressed the importance of explainable decisions: “a black box solution will not cut it“. Trisotech (Denis’s product) was frequently mentioned by different presenters at the DecisionCAMP as a tool they use for the latest DMN modeling. Jan’s conclusions: FEEL support is low; Still a gap between requirements modeling and execution tools; no hit policy has 100% support; no support for vertical decision tables; only 5 out of 13 considered tools did well. In my presentation, I introduced a Goal-Oriented approach to decision modeling supported by the latest release of OpenRules. I stressed that smarter decision engines can essentially simplify work of human decision modelers, e.g. by not forcing them to explicitly specify knowledge and information requirements which can be determined automatically. When Silvie Spreeuwenberg said she still does not like decision tables in my “Vacation Days” example, I said that I am also not satisfied with them and promised to show a different approach later. Jolyon Cox and Jan Purchase described the key challenges in building high-performance decision services and how to overcome DMN’s barriers to efficiency. The next two presentations were devoted to smart legal contracts. Dan Selman and Jerome Simeon presented the Accord Project. It is certainly a very interesting development that provides an open source middleware for smart legal contracts including predefined templates and a special language “Ergo” that allows legal-tech engineers (an interesting term!) to represent and execute the contract logic. It inevitably brought questions: “Can code be law?” and “Why not use DMN FEEL instead of Ergo?” Then Bas Janssen advocated an opposite approach that goes from the legal text via formal models to smart contracts. Bas stated: “We believe legal text not code(!) will remain predominant way to make agreements, laws and regulations”. To my surprise, Dan said that they don’t really rely on blockchain that is rather one of several implementation mechanisms. So, blockchain hasn’t even been discussed in the context of decision management this year. Hopefully blockchain technology will be better presented in 2019. Then a controversy came during Dr. Octavian Patrascoiu’s presentation. He described his translator from DMN to Java when every decision table is presented as an automatically generated Java class. He stated: “We have seen runtimes 4-10 times faster than previous engine execution in complex decision tests”. This obviously generated questions from the audience because most DMN execution engines today show very good performance (of course, when they are used correctly). I don’t know the actual story inside Octavian’s organization, but when he proudly listed an ability to debug the generated code in Eclipse, it forced me to say that the CASE technology failed many years ago exactly because a user who represented its logic in a modeling language received error messages in the terms of the generated code. So, you need to attach the author of the translator to the debugger to understand what’s going on. Sorry, Octavian, if it was too harsh but DecisionCAMP presenters expect tough discussions. The first day ended with an interesting presentation by Yoshihito Nakayama about applying process mining approach to decision making in sales activities, and then we had a nice welcome reception networking with people from RuleML and other LuxLogAI events. Carole-Ann Berlioz brought to light a good ‘old’ story about the practical use of spreadsheets in decision management. She also shared her experience of how to deal with gigantic decision tables in spreadsheets. Later this day during the QnA panel, Sparkling Logic CTO Carlos Serrano-Morales confirmed that after so many years of dealing with business rules in different organizations, the spreadsheet approach remains the second-to-none. Daniel Schmitz-Hübsch and Ulrich Striffler shared the lessons learned while applying DMN to very complex real-world decisions. They used their own annotations to explain the decisions (now they are a part of DMN 1.2) and added their own functions. They recommended to not allow too many exceptions but without saying how to avoid them. A controversy started when they said that they needed to fully translate FEEL into German for business users (while technical users never translate Java to German). Then they said: ”Don’t tell business users they’re programming: tell them it’s like Excel!”. This provoked another round of tough discussions “Whether DMN FEEL is a programming language or not?” and if yes, should we pretend it is not (“Don’t panic – be brave – use it”) or should we look for other ways to model decisions. It’s worth noticing that Daniel and Ulrich called their “from trenches” presentation “Decision Zoo”. Yoshihito Nakayama explained how the integration of their workflow product with a business rules & decision platform (OpenRules) brought them very impressive success in Japan & APAC markets. Jan Purchase and David Petchey took the liberty to “explain the unexplainable”. 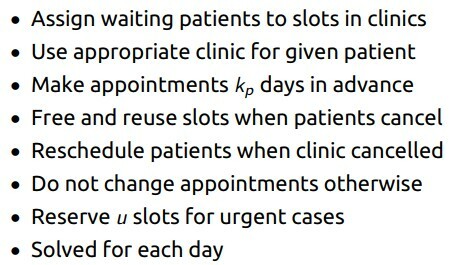 They suggested several possible ways of using DMN to justify the outcome of black-box analytics. While they applied the described techniques only to test examples, their presentation incentivized other attendees to share their experience of using ML and BR techniques in concert. Martin de Villiers presented his Fusion Project which allowed his S. Africa’s company to successfully replace “a legacy system elephant – one bite at a time with DMN and BRMS”. Their medical claim processing system now handles 410,000 claims per day servicing 125,400 healthcare providers. Martin stressed that they “had to get business buy-in first and then used the FICO DRAW methodology together with DMN to clearly document and scope their decision services. This took the longest time and was the steepest part of the learning curve, BUT it was most crucial to their success.” This was one of the most impressive presentations “from trenches” and I am sure if we had an award for the best real-world use case, Martin would win it. They requested help from the DM Community and well-known experts to change this situation. Despite several reasonable explanations, our audience was not ready to provide sufficient answers. The last presentation of the day was given by Matteo Mortari who described the progress with DMN Technology Compatibility Kit (TCK) and called for all vendors to join TCK. While QnA panels usually were highlights of previous Decision CAMPs, this year our QnA panel was “too peaceful”. The panelists said all the right things about importance of the standardization and the initial DMN success, decision explainability, orientation to business users, ML and BR integration, etc. We agreed on almost everything from a desire to make DMN “programming” more user-friendly (without actually telling how to achieve it) to being careful with the use of terms “AI” and “expert systems”. As Carole-Ann noticed, for the first time she saw Larry Goldberg and Carlos being on the same page. I tried to break this fragile unity by suggesting that DMN has already grown out of its baby pants and needs to essentially advance its modeling capabilities. It’s good that we give business users an ability to represent their existing business logic. However, our customers need more sophisticated decision engines which should help them reconsider the existing logic to make it simpler and without necessity to describe all exceptions to exceptions. It was kind of a relief when Larry said that “he agrees with everybody but Jacob”. I promised to provide specific suggestions at the end of the CAMP (see my closing remarks). Still, there were not enough questions from the audience and we had no time to seriously discuss tough questions. Afterwards, I heard a similar critique from several attendees, and in 2019 we will probably replace a QnA panel with round-tables without selected panelists but with coffee (bear?) and more open discussions. Day-2 ended with a nice river cruise dinner with more informal discussions. We planned to start the third day with an IBM’s presentation, but it was cancelled at the last moment because of a scheduling conflict. The good news was that Guilhem Molines, a product architect for IBM ODM, actively participated in many DecisionCAMP discussions and promised to present in 2019. 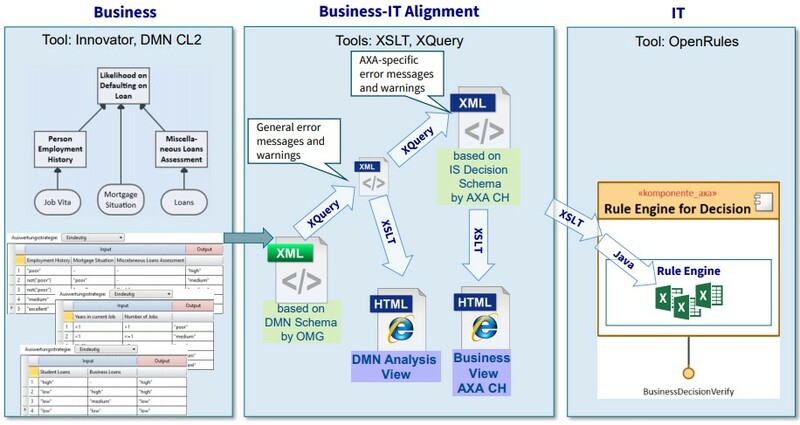 It did not go unnoticed when Wilfried said that AXA business users complain that instead of using a 3rd party modeling tool (Innovator) they would prefer to work directly with Excel decision tables (in the OpenRules format). Wilfried also said that the same decision model should be able to answer not just one but multiple questions. Helmut mentioned that these problems are relatively simple for modern decision engines which utilize constraint and linear solvers. However, the organizational issues are still there. Mark Proctor presented the history and the current state of the production rule systems. 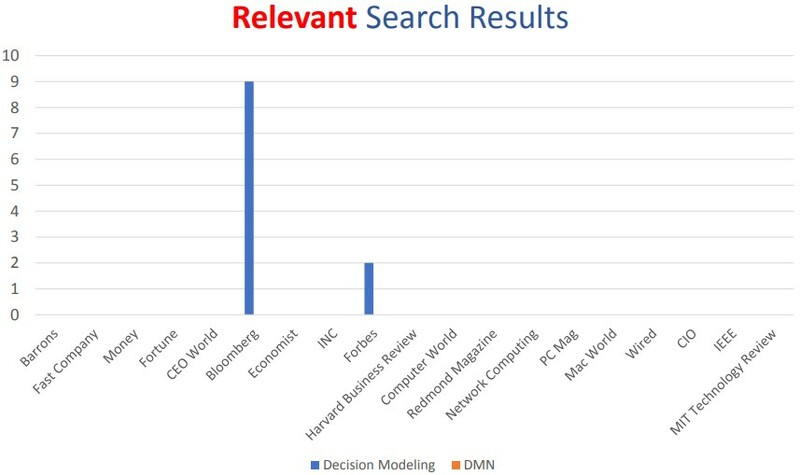 While many people stated that they don’t really care how decision engines are implemented, Mark’s presentation brought to light many important issues (such as TMS, Defeasible reasoning, pluggable beliefs) which cannot be ignored by DM product vendors. Tim Stephenson spoke about the use of DMN for modeling progress on Climate Change and Social Value Acts. And the final presentation was given by Brian Sticky who focused on the integration of business standards in the mortgage industry (MISMO) with technology standards (DMN, BPMN) to enable a powerful approach to handling FinTech and Regulatory Technology. We wish Brian success with his new endeavor “Decision-X”. DecisionCAMP-2018 allowed its participants to better understand the current state of different decision management technologies, to evaluate already achieved progress especially with a broad acceptance of the DMN standard, and to identify problems we face developing real-world decision-making applications. We considered different ways to address these problems. In my closing remarks I used two well-known problems (Vacation Days and Flight Rebooking) to show how a different modeling approach allows us not to worry about “exceptions on exceptions” and to avoid traditional programming. There is serious work ahead of us to come up with more powerful business decision modeling constructs which in particular cover decision optimization. At the same time, they should simplify (not complicate) work of business analysts allowing them to rethink their existing business logic. It seems only reasonable that next generation of decision engines should be able to decide themselves which mechanism (sequential or inferential rule engine, forward-chaining or backward-chaining, constraint or linear solver, etc.) to apply to correctly execute a decision model created by business people. 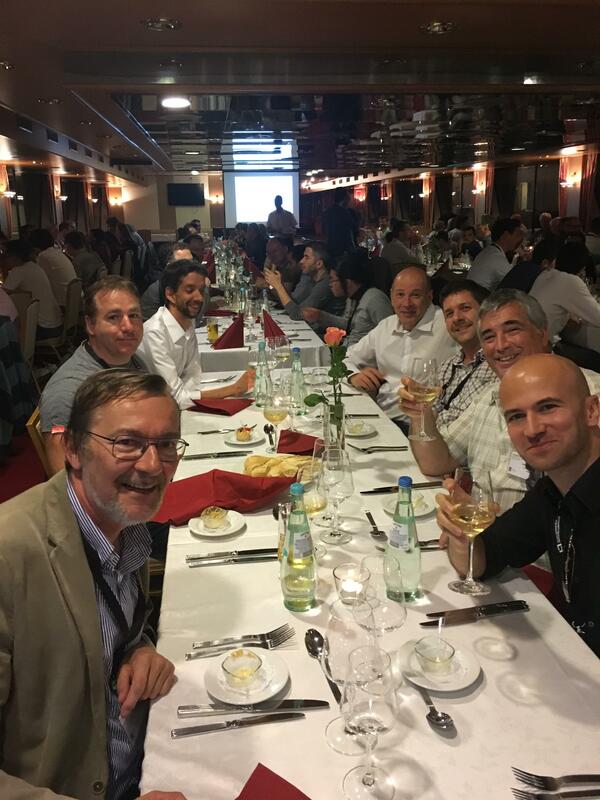 Hopefully, we will see significant progress during the next DecisionCAMP that will (preliminary) take place in Bolzano, Italy in September of 2019. Thank you to all presenters, attendees, and organizers. See you next year.